Missing or damaged teeth is a problem. Not only is there the inherent aesthetic issues that come with a gap in your smile, not having a tooth can also open the door for infection or other oral health issues. That is why it is imperative to replace missing or damaged teeth with dental implants. Dental implants are a simple and straightforward method to complete your smile, and Dr. Armin Hage and the rest of the team at University Dental in San Diego specialize in dental implants. that includes implant, abutment and porcelain crown. What are Dental Implants & How Do Dental Implants Work? 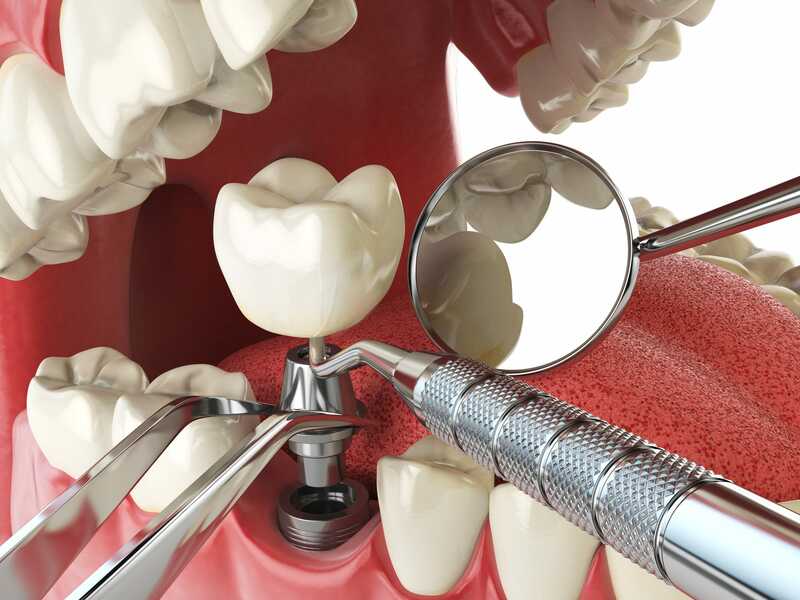 A dental implant is an artificial tooth that is inserted to replace missing or damaged teeth. A dental implant begins by surgically attaching a frame into your jawbone right below the missing tooth. This will serve as the root of the artificial tooth, providing a stable and long lasting base for the replacement tooth. The dentist will then attach the artificial tooth, which is a replacement that looks, feels, and bites just like a real tooth. Most people cannot even tell the difference! Are you missing multiple teeth? If so, the best option is the All-On-4 dental implant. The All-On-4 procedure is an excellent denture alternative to provide a permanent set of replacement teeth. The All-On-4 method is similar to a dental implant, except instead of having a root inserted into the jawbone for each and every tooth you need to replace, you can attach a whole set of teeth to only 4 frames inserted into the jaw. This allows for a minimally invasive procedure that can provide realistic replacement teeth for your whole mouth. Ditch the dentures and avoid the annoyance and embarrassment they can cause. Go with the better alternative with the All-On-4 dental implant procedure from University Dental in San Diego. Not only are dental implants an easy way to permanently replace missing teeth, the procedure is also simple and straightforward. At University Dental, we can get you new teeth with dental implants in one day! Whether it is a dental implant for one tooth or the All-On-4 dental implant procedure, we offer same day treatment. Walk into University Dental missing teeth, and walk out with a complete and perfect smile! Learn more about what is same day teeth replacement? Dentistry is not just a profession to Dr. Hage, it is his passion. Whether it’s a dental implant or a crown, he takes the time to get to know his patients personally and looks at each case as an individual work of art. He pays attention the smallest details, takes his time, and employs the most advanced scientific methods to ensure the best possible treatment for every patient. Since 2005, Dr. Hage has performed tens of thousands of successful dental and surgical procedures. Most notably, he’s performed over 3,000 dental implant procedures in the last ten years, at a very low failure rate. Due his proven success in implant dentistry, he now offers implant packages with a lifetime warranty. This serves as an additional benefit to his patients and offers peace of mind in knowing that their investment in oral health will last a very long time.